JOHANNESBURG (AP) — The United States military said Monday that its latest airstrike in Somalia killed 35 fighters with the al-Shabab extremist group not far from the Ethiopian border. JOHANNESBURG (AP) — The United States military says it has killed two al-Shabab extremists in four airstrikes in Somalia. JOHANNESBURG (AP) — The United States military says it has killed eight al-Shabab extremists with an airstrike in southern Somalia. A U.S. Africa Command statement says Friday's strike hit near Kobon, not far from the port city of Kismayo. NAIROBI, Kenya (AP) — The United States military says targeted airstrikes against suspected extremists in Somalia have killed 15 fighters. 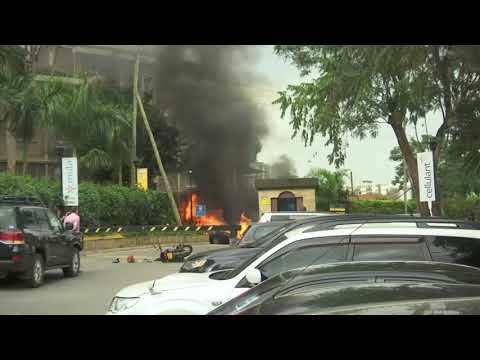 NAIROBI, Kenya (AP) — Somalia's homegrown extremist rebels, al-Shabab, have claimed responsibility for a car bomb explosion on Monday that killed at least seven people in Somalia's capital. JOHANNESBURG (AP) — The United States military says it has killed 13 members of the al-Shabab extremist group with an airstrike 30 miles (48 kilometers) outside Somalia's capital. NAIROBI, Kenya (AP) — Kenya's interior minister says a man with two New Zealand passports is among 10 people arrested over suspected links with extremism. Fred Matiangi said Thursday the suspects were detained in a crackdown earlier this week on alleged extremists at the Dadaab refugee camp, which hosts at least 200,000 Somali refugees. JOHANNESBURG (AP) — The U.S. military on Saturday said it had carried out its deadliest airstrike in Somalia in months, killing 52 al-Shabab extremists after a "large group" mounted an attack on Somali forces. Al-Shabab fighters burst into a luxury shopping mall in Nairobi, hurling grenades and starting a days-long siege that left 67 people dead. The assault on a sunny weekend afternoon horrified the world and exposed weaknesses in Kenya's security forces after it took them hours to respond. JOHANNESBURG (AP) — The United States military says it has carried out an airstrike in southern Somalia that killed six al-Shabab extremists. The U.S. Africa Command statement on Wednesday says Tuesday's airstrike targeted an al-Shabab camp near Yaaq Braawe in the Bay region. NAIROBI, Kenya (AP) — An explosives-packed vehicle detonated at a military checkpoint near Somalia's presidential palace, killing at least 16 people and wounding more than 20 others, police said. The al-Qaida-linked al-Shabab extremist group, which often targets Mogadishu, claimed responsibility for the attack. JOHANNESBURG (AP) — The U.S. military says it has killed 11 al-Shabab extremists with a pair of airstrikes outside Somalia's capital. The U.S. Africa Command statement says Wednesday's airstrikes were in self-defense after al-Shabab fighters attacked forces with the Somali military and the African Union peacekeeping mission. The statement says U.S. personnel were present "in an advisory capacity" and that no U.S., Somali or AU member was harmed.